Former U.S. Ski Teamer Bryon Friedman launched Soul Poles with the hope of creating an indestructible ski pole worthy of the World Cup yet completely eco-friendly. These poles are made of bamboo that Friedman sourced from a sustainable, family-run farm in China, and they're designed and hand built built in Park City, Utah. 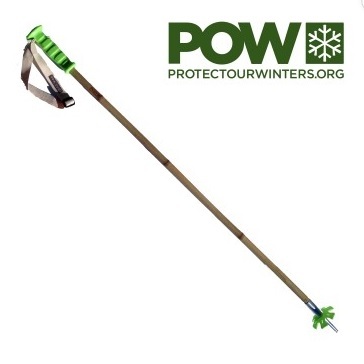 Their collaboration with nonprofit Protect our Winters results in Soul Poles POW Edition; it has a classic profile, green basket and grip, and a two-year shaft warranty. Best of all Soul Poles donates a portion of the proceeds to Protect Our Winters' work fighting global climate change.